Welcome to the magical world created by J.K Rowling. 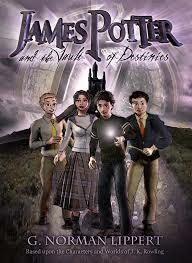 Harry Potter and the Philosopher's is J.K Rowling's first book out of seven. Harry begins his first year at Hogwarts School of Witchcraft and Wizardry and he finds himself face-to-face with Voldemort for the second time. In Harry Potter and the Chamber of Secrets, Harry starts his second year at Hogwarts. There is panic around the school as they find out that the heir of Salazar Slytherin has returned to Hogwarts and people are being petrified. Who is the heir of Slytherin? In Harry Potter and the Prisoner of Azkaban, Harry is in his third year and once again a new Dark Arts teacher is in place. Many security measures have been put up everywhere in Britain because a high-security prisoner from Azkaban has escaped. In Harry Potter and the Goblet of Fire, Harry's fourth year begins and the Quidditch World Cup is in Britain. Hogwarts has been chosen to hold a legendary event called the Triwizard Tournament. Two other wizarding schools, Durmstrang and Beauxbatons travel to Hogwarts to compete. Someone has entered Harry, but who? In Harry Potter and the Order of the Phoenix, there is a new teacher for DADA and she won't let any students use magic in her classes. Why is she doing this? Harry, Ron and Hermione create a secret organisation for students to learn proper DADA. Find out why Harry bring five students with him to the Ministry? In Harry Potter and the Half-Blood Prince, Horace Slughorn is the new potions master. Snape now teaches the Dark Arts lessons and Draco Malfoy is given a task. What is the task and who has given it to him? 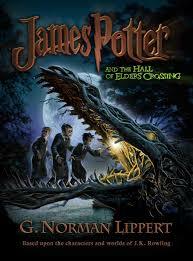 But Harry has retrieved an old potions book which belonged to the Half-Blood Prince. Who is he? 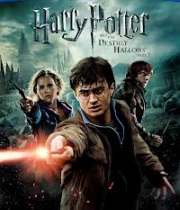 In Harry Potter and the Deathly Hallows Part 1, Harry, Ron and Hermione are on the run. The Trio have just come of age so they start hunting down the horcruxes and learn about the Deathly Hallows. Harry knows he must face Voldemort and kill him but must destroy the horcruxes first. In Harry Potter and the Deathly Hallows Part 2, the trio return to Hogwarts for the ultimate battle. Who will win, and who will die. Find out the secrets of Severus Snape: Was he really a death eater; why did he save Harry in his first year? Why was he so close to Dumbledore? If you loved the Harry Potter series and want more, then here it is: This is the series about Harry's children at Hogwarts. This is not available as a proper book but only as an eBook. 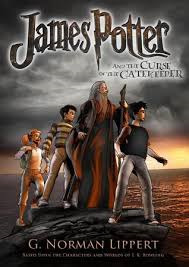 If you want to read this online, go to www.goodreads.com and search for James Potter. This is what they are called: Hall of Elder's Crossing, Vault of Destinies, Curse of the Gatekeeper and the last one is the Morrigan Web. I have listed these in the correct order. The author of these books is G. Norman Lippert.